Featuring geometric panelled doors contrasted with iron hairpin legs, the Conrad console unit is a sturdy piece that fits perfectly in industrial style interiors. The raised body and elongated hairpin legs create an interesting silhouette for the Conrad unit. Meanwhile, the solid wood panelled doors are made of individual timber pieces, forming a gorgeous geometric starburst. 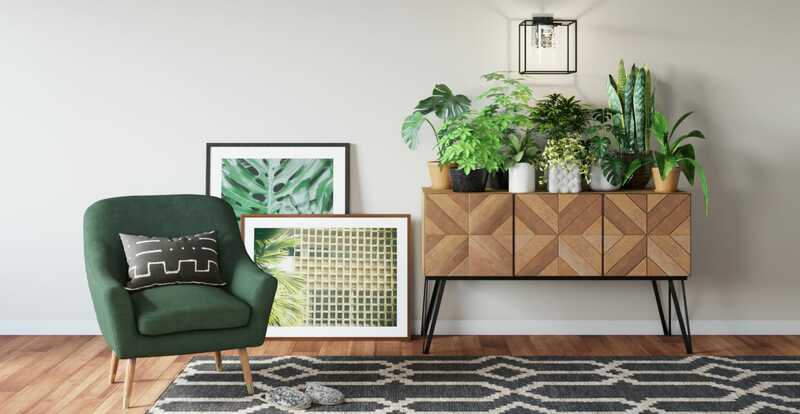 You'll have more than enough storage on offer with the Conrad Large Sideboard, which has ample shelf and cupboard space to stowaway items and keep your home looking clean and fresh! Solid Mango wood is known for its strength and natural beauty, and this material shines in the Conrad. A washed effect and black panel detailing complete the look, and the naturally occurring variations in the timber make every piece individual. Does the door align with the top surface? Great range. Love my sideboard. Delivery guys were super efficient. Products were of great quality, all pieces were as pictured, service was wonderful, packaging well protected each item, delivery was on time as arranged and install instructions online easy to follow. Good news! Conrad Large Sideboard is currently on display in our Alexandria Collingwood studio.